We could probably have done a better job of recording all the incidental costs which we have just captured here under Misc…. things like food and drink, taxis, tours, haircuts, massages, ice creams etc etc etc, but that will have to be an improvement for future blogs as we just didn’t really record these as we went along. 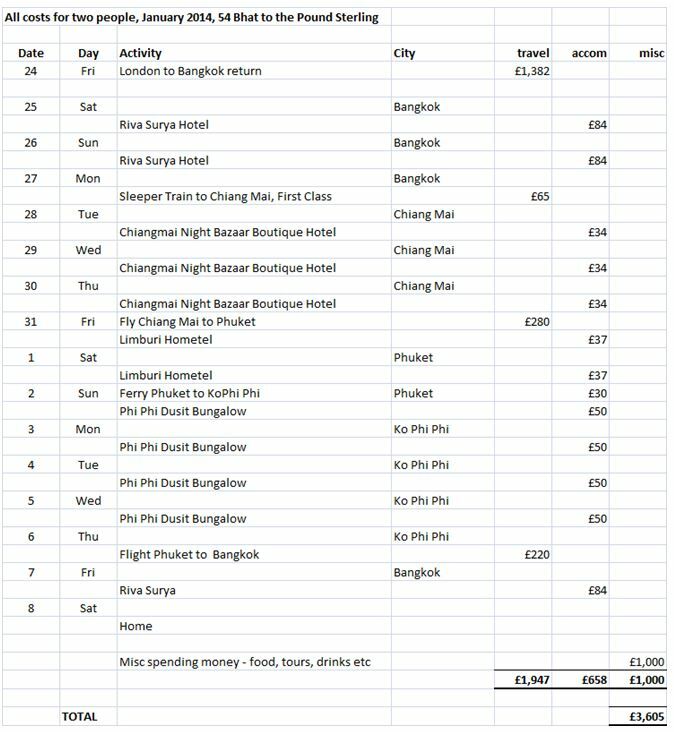 All the major travel and accommodation costs are in here though, and the total is about right. We could have saved on this amount and cut corners, or we could have spent a lot more… but looking back we got the blend just about right with a mix of luxury and basic on the accommodation front and the travel front. Getting out there was clearly the biggest expense – so the longer you stay, the better value you get from the flight. We managed to eat cheaply but deliciously, and seeking out the little local restaurants where the Thai’s ate was as much about experiencing the real Thailand as it was about being frugal! It’s hard to think back over the holiday without finding yourself unconsciously salivating so good was the food! I was surprised by the low cost of the accommodation and you said there could have been room for negotiation. As for the little expenditure I feel it is not worth documenting them as you would be spending the same if not a lot more back home in England. When you are travelling away from home there are no shopping, petrol, and other day to day expenditures. I love cost posts 🙂 I find tracking my expenses so useful when I travel; it looks like you had a pretty reasonably-priced trip and had a great time too. Yes I also love posts on the cost of travelling and I hope to keep better track of my expenses in the future. We did find Thailand to be a very cheap country and amazing value for money. Oh Thailand has been on our list even before we started traveling. Wonderful to see how reasonably priced your holiday was! We have a trip to Africa planned for 2017 but following it is time to get ourselves to Asia I believe.